Please join us along with SJU President C. Kevin Gillespie and SJU student/artist Holly Colaguori, ’12, on Monday October 22nd, 2012 when we unveil a painting celebrating the 60th anniversary of Air Force ROTC here at Saint Joseph’s University. The painting will be unveiled and placed in the first floor of Drexel Library. A second viewing of the film “A Question of Habit” will be offered at the Post Learning Commons for faculty, staff and administration. Writer-Producer-Director Dr. Bren Ortega Murphy will be on hand to discuss how this film can be used effectively to teach U.S. cultural studies, gender and the intersection of religion and culture. 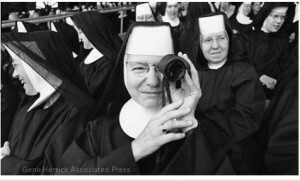 A Question of Habit explores popular culture’s fascination with all things “nun” and dives into the real stories behind the women religious in the United States from the battle field medics of the Civil War to the creators of the first HMO in the Country to the political activists fighting against capital ?> punishment.? The film is narrated by Academy Award winner Susan Sarandon. Saint Joseph’s male and female a cappella groups will provide an early evening performance on the plaza in front of the Post Academic Center. January 17th, Writing Center Satellite Location Reopens! The Writing Center’s satellite location at the Drexel Library is back! Hours will begin begin on Tuesday, January 17th, on the first floor of the Drexel Library. Students can stop by and make an appointment with a Writing Fellow, Monday – Thursday, 4 p.m. – 6 p.m.
For more information about the Writing Center, please visit their homepage, or call their main location in 162 Merion Hall, (610) 660-1341. Renovations to our accessible entrance for those with physical disabilities are complete and access has been restored.